It was a perfect 80 degree afternoon, earlier this week, when I was downtown. I was astounded by the changes within a few short months. 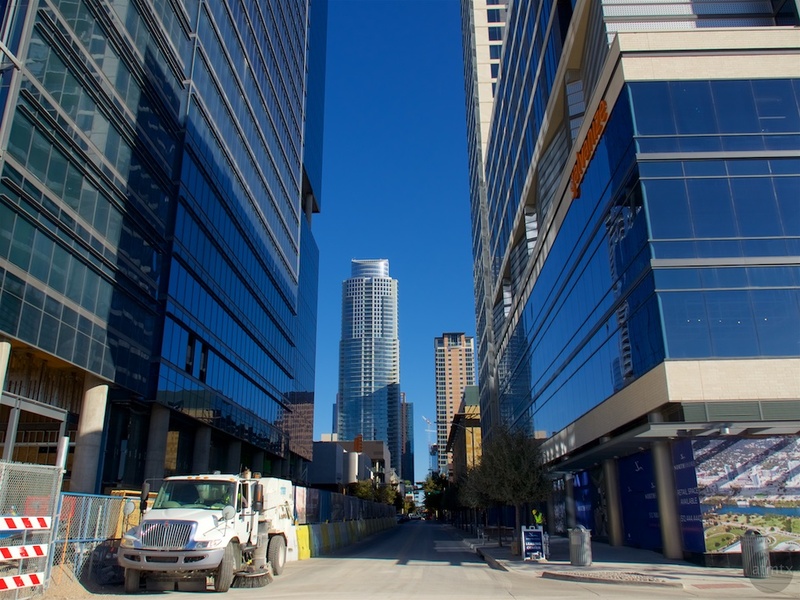 Downtown Austin continues to build at a breakneck speed. There’s construction all over the city, but currently, the west side is seeing the most concentrated development. I decided to document this moment, before the completion of these projects. On the right, the recently completed 38 story Northshore apartments stands next to an office building that is nearing completion. 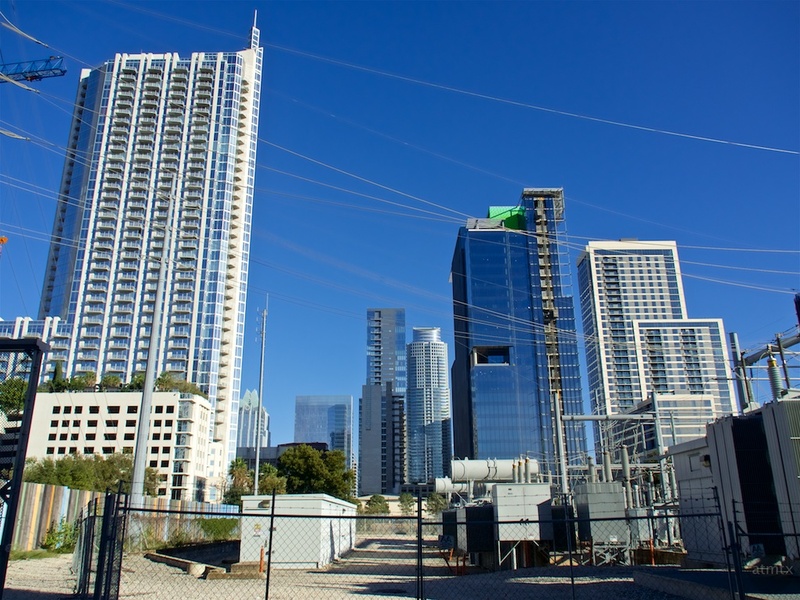 The 360 Condominiums, with the spire on the left, is currently the second tallest building in Austin. It was finished back in 2008, part of the previous wave of development. I saw a continuous stream of dump trucks emerging from somewhere. I didn’t realize how many building are now under construction until I started exploring. Unlike the simple, boring rectangular boxes of the past, I like that the new skyscrapers have some character. At least, instead of a single box, there are multiple stacked boxes. Also, the materials and texture of the apartment building differs and contrasts against the adjoining office tower. At least there is some variety with the facades. As I turned on to 2nd street and followed the workers, I discovered the source of the dump trucks. Beyond the two new buildings, to the west, there was an open pit, being readied for a foundation. 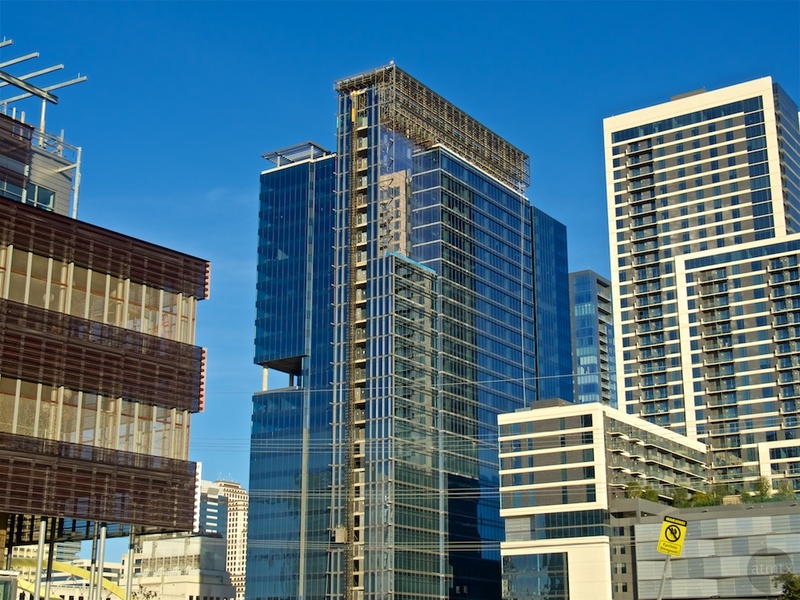 A little research revealed that the 32 story Austin Proper Hotel and Residence is scheduled for that site. 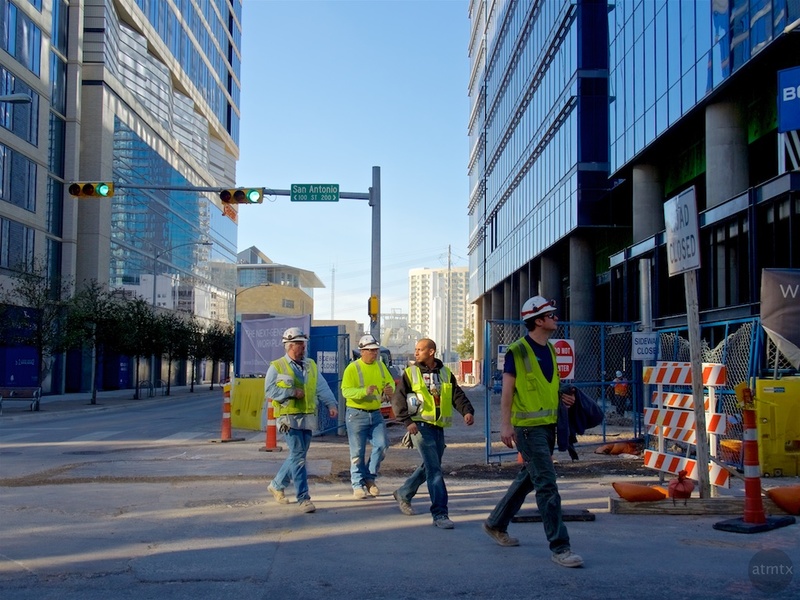 Second Street is being extended west to connect these developments into the downtown grid. The taller blue tower, in the distance, is the Austonian, which is currently the tallest building in Austin. It’s also the tallest residence west of the Mississippi River. 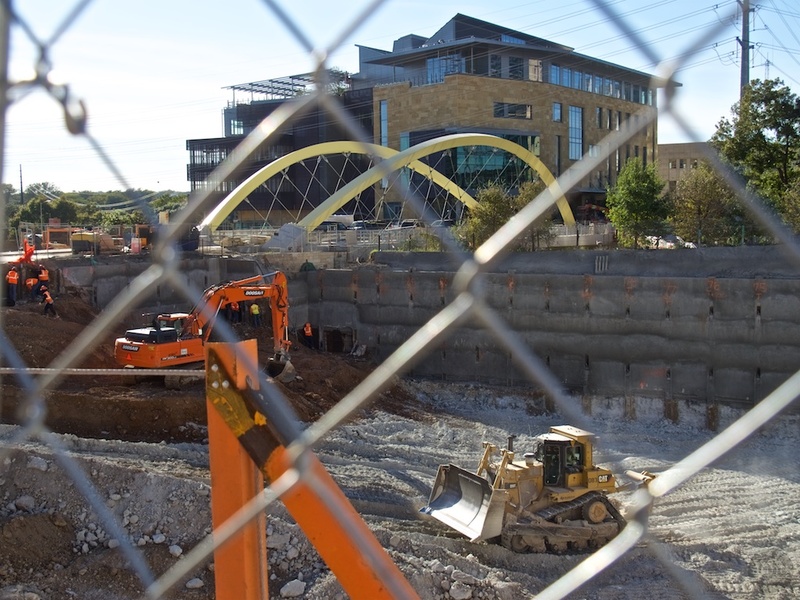 Beyond the chain link fence, you get a better view of the foundation for the Austin Proper Hotel. You realize how small those dump trucks are, since they only hold several buckets worth of material from the backhoe. There must be hundreds, perhaps even thousands of truck runs required to excavate a hole of this size. Beyond the big hole, the nearly completed Austin Central Library, scheduled to open sometime in 2017. 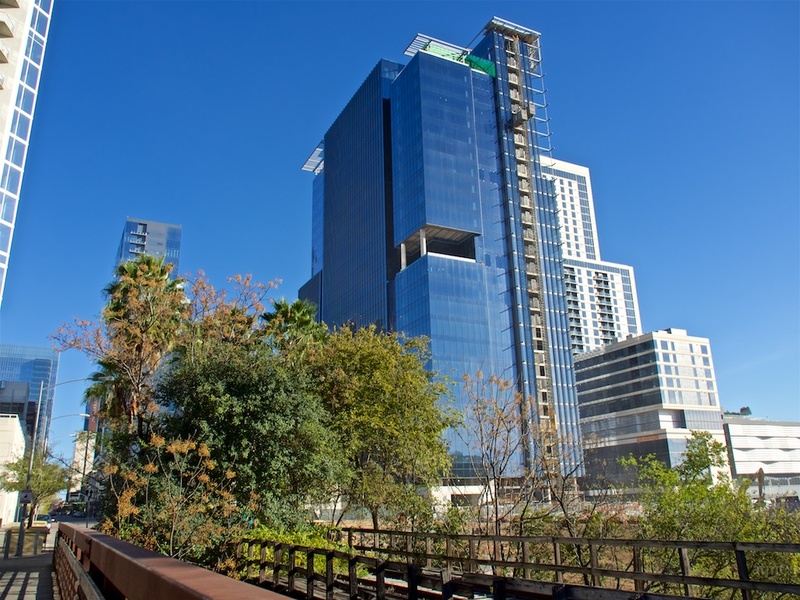 Next to the big hole of the Austin Proper Hotel, another area is being readied. 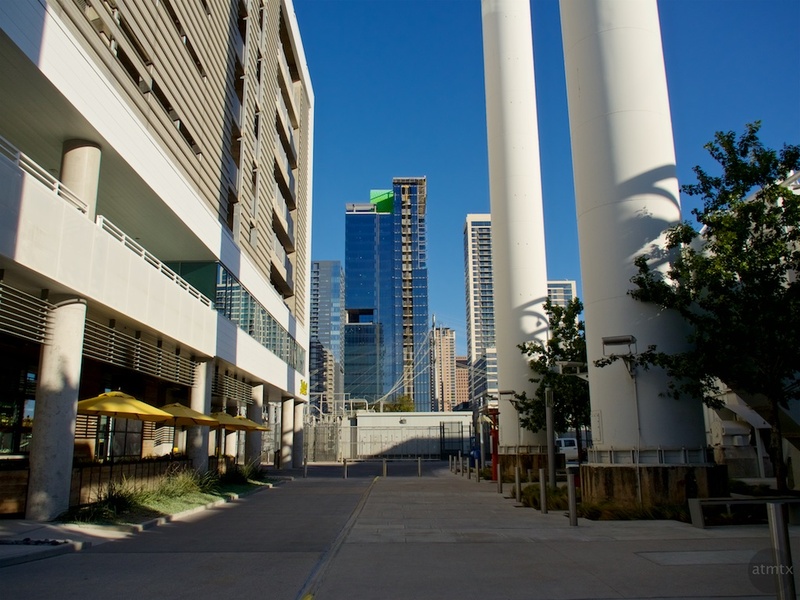 Just a couple of months ago, the Austin Music Hall stood here. Demolished to make way for a 29 story office building. The high rises beyond are all new. All built within the last decade. All residential towers. 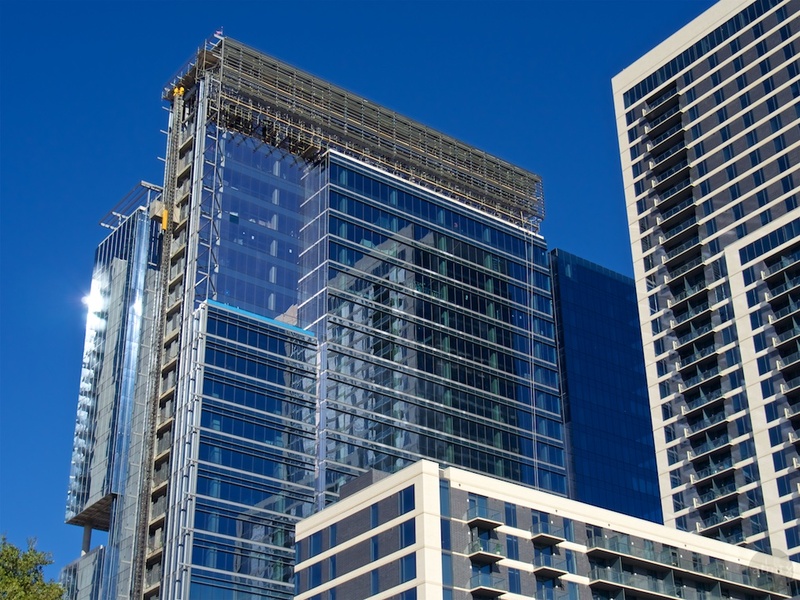 The two cranes atop the 5 floor structure is the start of the Independent, the future tallest building in Austin. 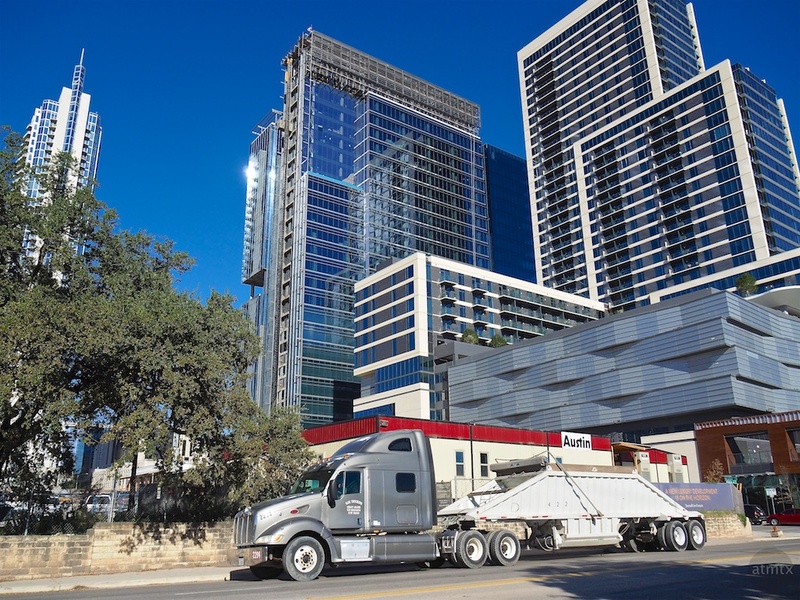 This 58 story tower will steal the “Tallest Residential Building West of the Mississippi” crown away from the Austonian. We are not quite Dubai, but we do have some jockeying for bragging rights. 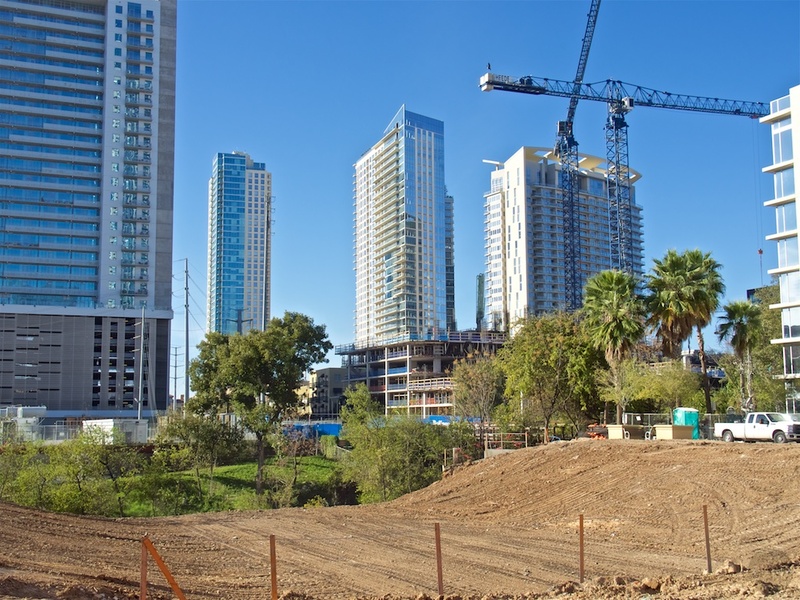 All of this new west side development is straddling Shoal Creek. This pedestrian bridge over the creek, connects the two sides. A new bridge has also been built to extend 2nd street all the way to the Seaholm Power Plant Redevelopment, which has now been completed. Here’s a view east from the Seaholm Redevelopment. You can see that all of this development is happening in a small area. By my count, there are currently 5 buildings in various stages of construction, just in this area. Unfortunately, this unsightly electrical substation is going to remain. There is supposed to be an artistic wall that’s going to pretty up the space. I don’t know about you, but if I were paying the big bucks to live in those high rises, I would hate to look down on a power substation. A wall is not going to hide that view. The Seaholm Power Plant was in active use until 1989. It laid dormant until 2013, when the redevelopment started. 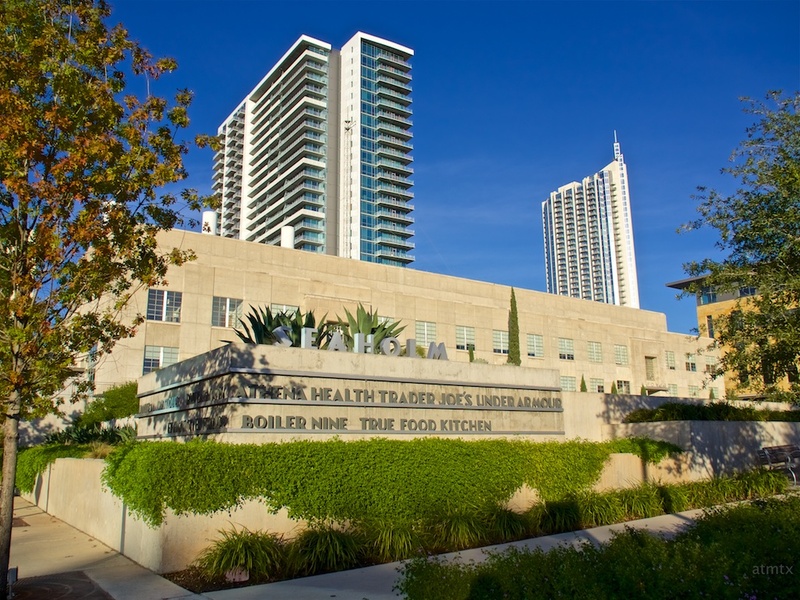 The main power plant was cleaned up and made into offices and restaurants. 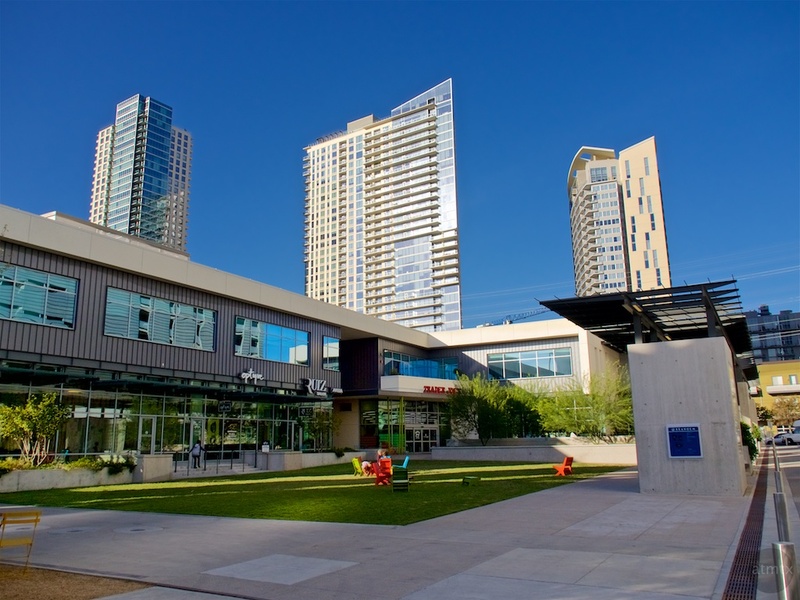 As part of the development, additional stores, restaurants and a residential tower was also constructed. Under this open green space is a large parking lot. The entire redevelopment appears to be complete. I got to take pictures within the Seaholm power plant, before it was redeveloped. I blogged about it back in April of 2011. 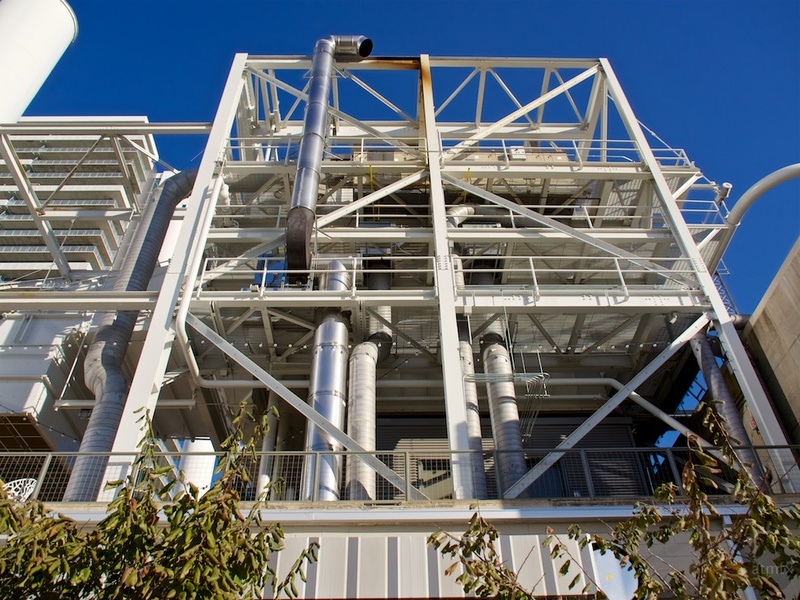 The power plant’s super structure, tubing and chimneys were left in place, which adds the character. That’s what separates it from any other generic developments. I think it came out great, though I wished they put the shops in the old power plant, instead of the offices. Finally, here’s one last look at the newest, mostly completed buildings. I kind of like the contrasting blocky buildings, all with their unique color and texture. The rust colored building, on the left, is the new Central Public Library. Consider that every featured building on this post, with the exception of the original Seaholm Power Plant, did not exist 10 years ago. So many changes. I have no idea how long this pace of development will keep up, but I wanted to document these changes for future generations. The construction in downtown is staggering. It would be nice if public transportation played a more prominent role in the city’s extremely aggressive expansion. There is so much effort directed at getting more and more people packed into downtown for living and work and no solid plans for improving gridlocked traffic. A city about to burst at its seams. Nicely documented Andy. 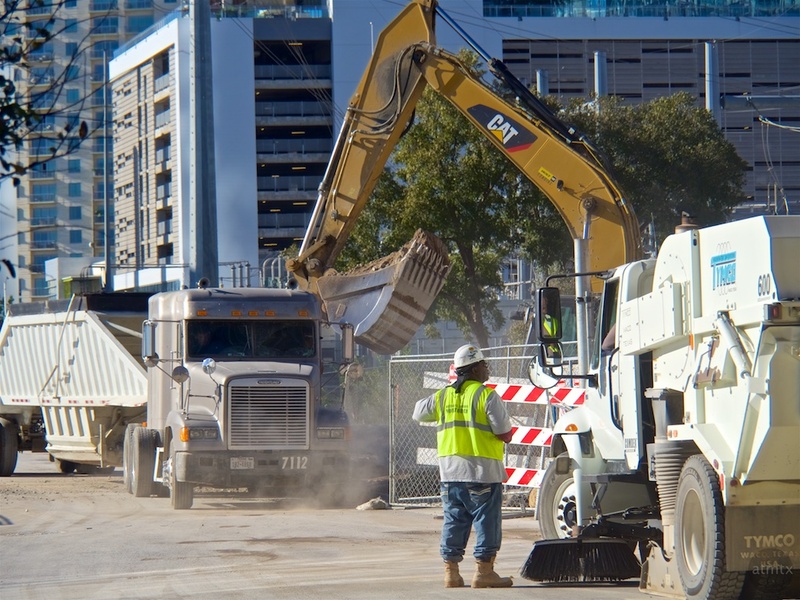 What a pace construction is setting in your city, the best thing you can say about it, in my opinion, is the employment it provides. My city of Victoria BC Canada has experienced similar growth which I grumble about because I liked it the way it was going way back to late ’50’s and early ’60’s, but we can’t stop progress. 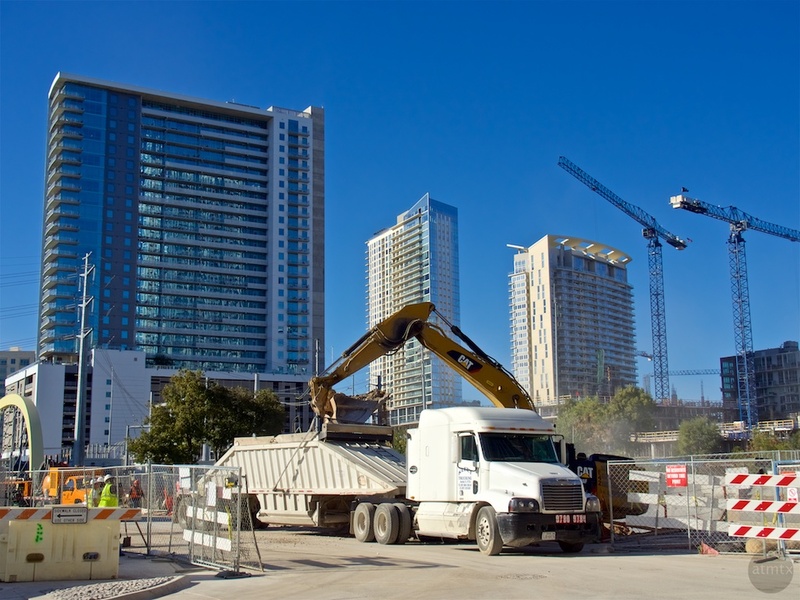 The biggest problem new construction creates is with traffic, just as it is doing in Austin. Seems that planners never think of how the increase in traffic is going to be handled until it’s too late and we end up like every other city. In Victoria we used to dread the 5 o’clock traffic jam now the traffic jam is all day long. Our ‘brain trust’ (aka politicians) have talked about rapid transit for over 40 years but nothing ever happens, study after study, which are all done on my tax dime, continue with no conclusion, meanwhile the traffic backs up further and further. I’m retired so I don’t have to deal with the traffic very often, I can pick the best times to travel. Our traffic problems compared to large city’s (L.A. comes to mind) are minuscule but even on a smaller scale they’re frustrating. I enjoyed your Seaholm power plant photo’s, a good opportunity for you to document it. I agree about the unsightly substation being in the heart of residential development being an eyesore for new residents. There was a situation in my neighbourhood where the telephone company bought a 50’s style home, gutted it and built a two story substation inside it, leaving the place looking no different from the outside. The substation is smaller than the one in your photo but I thought it was a good solution to something that could have been done without regard to the neighbourhood. I’ve told friends about the place and they had no idea it is a substation. Victoria BC sound a lot like Austin. Lots of plans for rapid transit but, not much movement. But a lot of people don’t believe in it, they just want to build more roads, which we know is not going to work. LA evidence of that. Thanks for the guided tour. 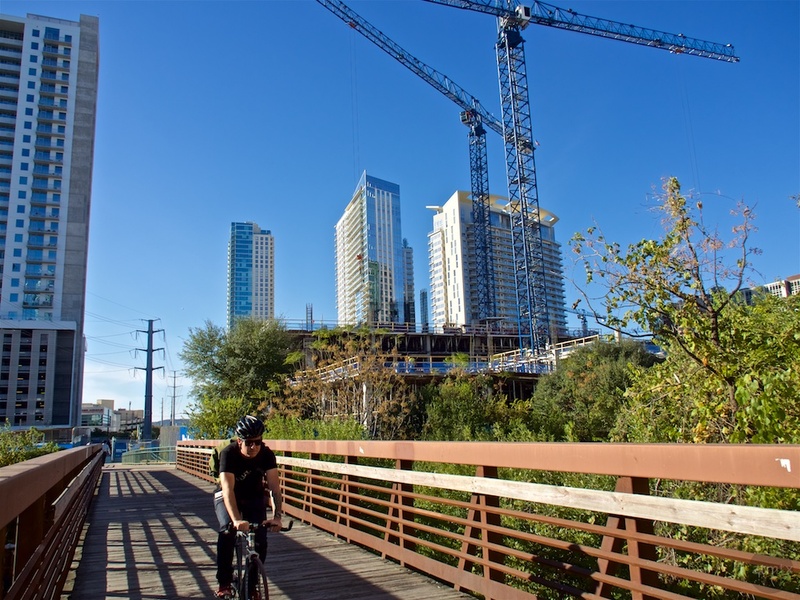 I was unaware of the scale of development going on — although something lurks in the back of my mind about the Texas state bird being the construction crane. “Dig We Must”, as Con Ed used to say in your old hometown. Anybody looking at this series really should click on your link to the earlier post on the power plant. Great stuff. Glad you liked it, Mike. Thank you for your continued visits.